Netizens react to Star Cinema's announcement that Angel Locsin will reprise the role as "Darna"
On October 6 (Sunday), news about Angel Locsin to reprise the role of "Darna" in a Star Cinema movie as confirmed by its managing director Malou Santos spread like wildfire. 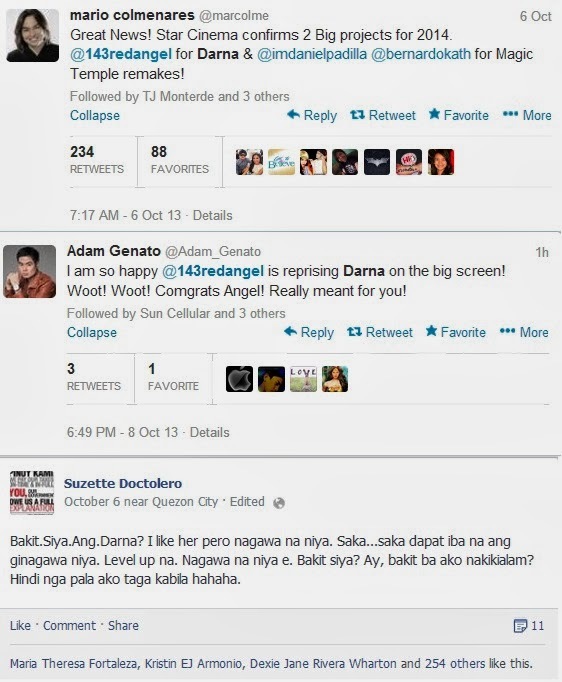 You heard it right, Angel will reprise the role that made her famous 8 years ago on GMA Network, now on Star Cinema. Angel don the role in 2005 on GMA Network but when she left, it was given to actress Marian Rivera to reprise the role in the series. Upon announcement, 'Angel Locsin is Darna' made it to the trending topic on Twitter nationwide and recieved a lot of netizens' reactions from different social media sites. Some of them are happy and some are not. Well, that's normal. I think Angel Locsin was fit and right for the role to reprise the Darna role in the movie. Because she has the body, the action skills, the charisma, the astig porma like angeline jolie and most of all sikat sya. Syempre hindi ssugal ang star cinema sa iba kailangan kumita ang movie..